Ever notice that the first few columns on a TimeToSignUp sheet fill up first? And have you noticed that the items at the top of each column are the first to be claimed? Participants typically sign up for these items right away, leaving some of your items (those that are in the columns to the right or near the bottom of the columns) unclaimed. In the same way that people read the headline of the newspaper first, people sign up for the items on a sign up sheet that are easy to see. 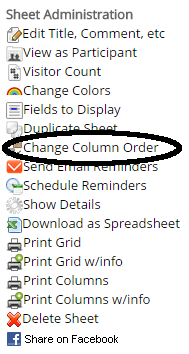 If the items at the top left of your sign up sheet are filled up, use this pro tip: reorder your columns and items. Move the claimed items to the bottom of the column, leaving the unclaimed items at the top of the column where people will be more likely to see them – and sign up!